Over at Comiket, Takara Tomy have unveiled the next set of Video Game Robotics gashapon that were meant for a June release (that are now scheduled for December instead). 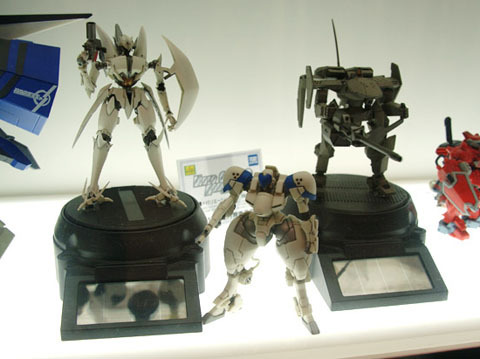 In total, the series will contain four mecha from four different games. They are the PDF-802 X-4+ from Power Dolls 2, a PC turnbased strategy game with mecha designed by none other than Hajime Katoki. Followed by the HIGH-MACS 12 from the original Gungriffon and then the V-MH GLORY from the super rare Metal Slader Glory adventure game on the Famicom (later ported to the Super Famicom). The last mecha, of the four, is apparently a new blast runner from the upcoming Border Break Air Burst. However, all this may sound and look wonderful but the last set of gashapon in the range were pretty awful and they cost 700 yen a piece, these new toys cost 400 yen each. Considering the poor quality of the previous set, reducing the price for the new one doesn’t exactly bode well really. What about that Bloodia hiding there in the corner? That’s the one I want!